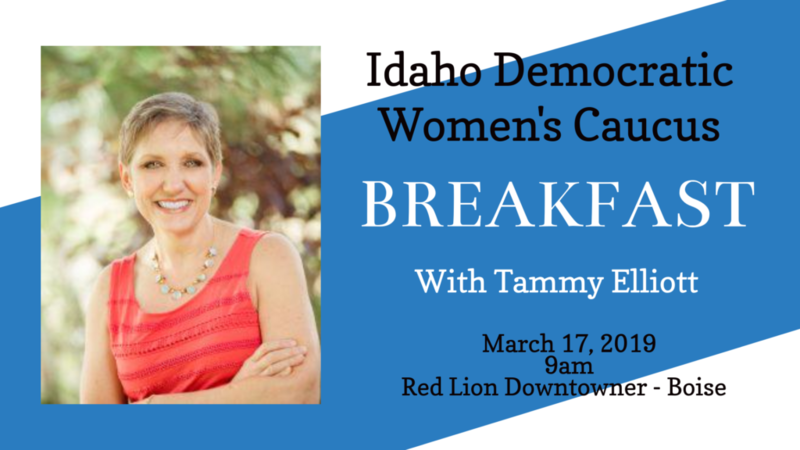 The Idaho Democratic Women’s Caucus wholeheartedly invite Democratic Women throughout Idaho to our Annual Membership Meeting. The Meeting is on Sunday, March 17, 2019, at 9 am at the Red Lion Hotel Boise Downtowner, which is located at 1800 Fairview Avenue in Boise. Tickets to the breakfast are $25.00 per person and can be bought on Eventbrite. We are proud to announce that our featured speaker will be celebrated novelist Tammy Seley Elliott. Tammy is a veteran of the United States Air Force who served her country proudly for almost three decades before retiring in 2011. Tammy recently served on the Collum for Idaho campaign as Chief of Staff and Chief Multi-tasker. There was no task that Tammy did not complete including serving as a human podium at an event. Tammy and her husband currently reside in the Treasure Valley area and have two grown children. We encourage all Idahoans to join our organization and to work together in electing more Democratic Women to public office. To become a member or renew your existing membership, you must complete the Registration Form and pay the annual membership dues. Annual membership dues are $20. Seniors (65 and older) and students can join for $10. Members are encouraged to attend and participate in the breakfast meeting as we will be electing the IDWC Secretary and Treasurer along with Regional Directors for regions 1, 2, 3, and 7. Although our annual membership meeting centers on enjoying a great breakfast and discussion, the agenda also includes the election of individuals to the above aforementioned vacant IDWC leadership positions. Therefore, we encourage our members to stand for election. Consequently, if you wish to be considered for an open position, please submit your name and a summary of your qualifications to Gini Ballou. If you seek to hold a Regional position, please include the region. Region information is available on our Officer page. Additionally, don’t forget that we are seeking nominees for the Dottie Stimpson and the Distinguished Woman awards. The Stimpson award honors an IDWC member who demonstrates perseverance, persistence, patience, passion, commitment, and leadership. IDWC co-founder Dottie Stimpson inspired the award. The Distinguish Woman award, on the other hand, is a way for us to recognize the contributions of rising star. You can submit a nominee by filling out the online Nomination Form or submit the nomination details in an e-mail to our Awards Committee Chair: Shirley McFaddan. All nominees must be active IDWC Members. Submissions are due by February 15. For more information about this event, please contact our organization by via email at idahodwc@gmail.com or find us on Facebook.